I’m attracted to public sculpture that is playful and temporary, something exemplified by Simon and Tom Bloor’s Ludus Folly. 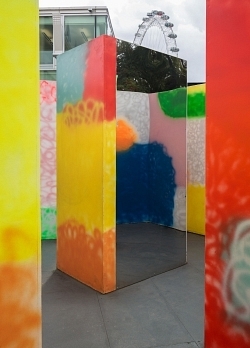 This architectural playground, which included a mirrored and spray painted maze, no longer exists and was specially commissioned and installed for the Southbank’s 2015 Festival of Love summer. The structure’s geometric footprint was based on diagrams for the chemicals Serotonin and Dopamine, which are associated with the pleasure and excitement, we feel when we are at play or in love. I admire the way the Bloors take children and adults equally seriously as their audience and I am also drawn to their practice more widely as we share the same formative experience of growing up in Birmingham surrounded by experiments in twentieth-century civic art and architecture. This environment has been a strong influence on their practice and my own aesthetic sensibility. My choice of Ludus Folly , a public work which lives on in memory, is in direct contrast to the statue of King George I by Flemish sculptor John van Nost the Elder which is firmly in my ‘dislike’ category. This is a sculpture that has outlived its era and while I would defend and support the nationwide presence of historic statues of abolitionists, pacifists, suffragettes and other campaigners, we could perhaps fade a number of statues of monarchs permanently into the background and reuse their plinths. This particular statue does, however, at least sit outside The Barber Institute, a hidden gem of a collection on the University of Birmingham campus.